Product prices and availability are accurate as of 2019-04-24 22:31:14 EDT and are subject to change. Any price and availability information displayed on http://www.amazon.com/ at the time of purchase will apply to the purchase of this product. Disposable doesn't have to be a bad word! 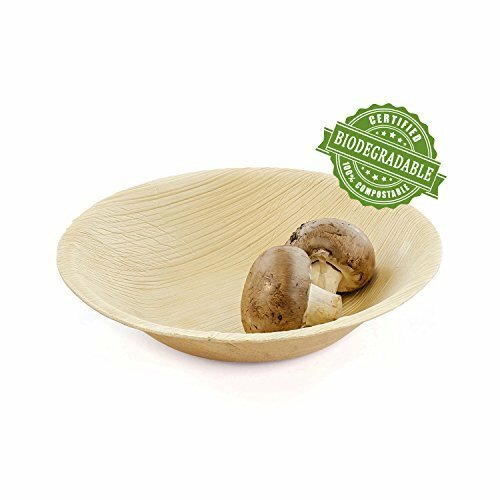 These single-use bowls have been made using naturally fallen palm leaves and are 100% biodegradable. No trees are harmed in their production, no chemicals are used to prepare them, and they compost fully within 2 months. If you're eco-conscious, you can be sure palm bowls are a green choice. Just because palm bowls are from a natural and sustainable source, doesn't mean they aren't suited to the needs of diners. These bowls are extraordinarily durable. They are microwavable, oven safe, and can withstand temperatures up to 350 degrees Fahrenheit for up to forty-five minutes. Palm is so tough that it isn't prone to cracking or breaking, and more importantly it resists leakage from grease and liquids. With palm, you get a sturdy, resilient piece of dinnerware. Whether you're dishing out soups, salads, or even curries, these bowls are up for the challenge. These dishes have been handcrafted to ensure you get the best quality product possible. 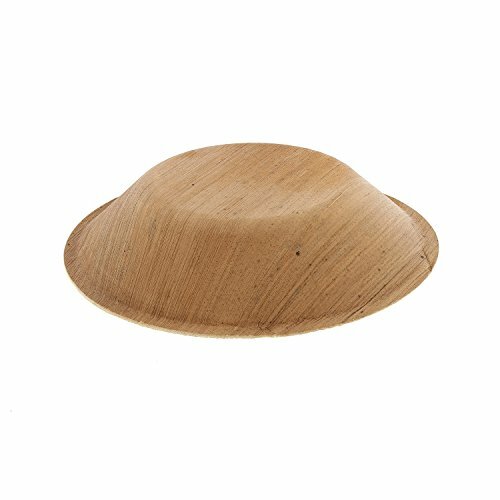 Regardless of what's on the menu, palm bowls are perfect for any culinary occasion since they offer a unique combination of durability and environmentally-friendliness. 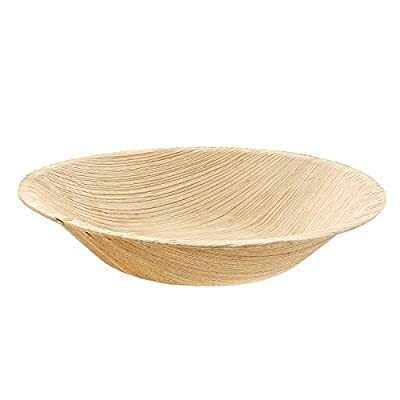 FOR FINE FOODS, CHOOSE QUALITY DINNERWARE - Stylish yet functional, these palm dishes have been made using premium quality, naturally fallen palm leaves. They are a great alternative to the typical disposable plastic dinnerware. Instead of coming from a factory, palm dinnerware is handcrafted to ensure you get the best product possible. KEEP THE ENVIRONMENT TOP OF MIND - By choosing palm, you get an eco-friendly product that is 100% biodegradable and compostable. Within 2 months, the leaves will have composted fully. Each palm leaf is completely hygienic and has been prepared without the use of chemicals, dyes, or resins. Best of all, no trees are harmed in their production since the leaves have fallen off the tree naturally. PERFECT FOR ANY OCCASION - Palm dinnerware is oven safe, microwavable and grease resistant, making palm the perfect choice for any culinary occasion. Whether you're serving hot pizza straight from the oven or cold ice cream, palm is tough enough to handle a variety of temperatures. It's extraordinarily durable and resists cracks, breaks, and leaks. USE AT HOME, IN YOUR RESTAURANT, OR WHEN CATERING - Palm leaf plates feature a strong, durable design making them ideal for weddings, cocktail parties, BBQs, picnics, and much more. Regardless of what's on the menu, palm bowls are perfect for any culinary occasion since they offer a unique combination of durability and environmentally-friendliness. BOWLS AND PLATES TO FIT ANY NEED - From large deep dish plates to appetizer sized bowls, CiboWares has a variety of palm dinnerware available. And it doesn't matter if your palm dishes are big or small, you are sure to get an environmentally friendly, durable, stylish piece of dinnerware.